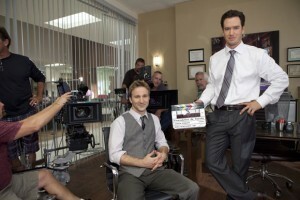 Fans of the buddy drama Franklin & Bash should be happy to know TNT will be renewing the series for a fourth season. According to the network, the fourth season will consist of 10 episodes and will air next summer. Breckin Meyer and Mark-Paul Gosselaar will be returning to star in the series along with Malcolm McDowell and Reed Diamond. The show, which is executive produced by Jamie Tarses, Kevin Falls, and Bill Chais, has been averaging 3.4 million viewers. The Plot: “Franklin & Bash centers on Jared Franklin (Meyer) and Peter Bash (Gosselaar), two young, fly-by-the-seat-of-their-pants street lawyers who caused a seismic culture clash when they joined Infeld-Daniels, a legendary, button-down law firm. The patriarch of the firm – the brilliant and eccentrically spontaneous Renaissance man Stanton Infeld (McDowell) – hired them because he admires how Jared sticks it to authority every chance he gets and how Peter is able to forge a personal connect with both judge and jury.